The great man is gone, his belongings all being sold off in a high-end car boot sale, but you can’t take away his music. 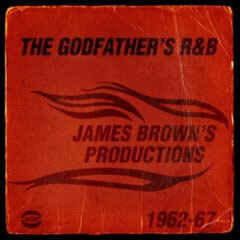 And not just his own work, Brown was responsible for producing some great tunes too, many compiled on The Godfather’s R&B – James Brown Productions 1962-67, released by BGP on 30th June 2008. On the CD, you’ll find early recordings by Bobby Byrd and Vicki Anderson, sought-after dancefloor collector’s items by Elsie Mae and Dizzy Jones, the James Brown band before they became the JBs and Yvonne Fair belting out the original version of James’ ‘I Got You (I Feel Good)’ titled ‘I Found You’. There’s also James’ tribute to influences and heroes from his early days with records by the Rev Willingham and the Five Royales, and James lets loose on his organ a couple of times. The roots of funk, as well as some top-notch R&B. Check out the details of the tracklisting at the Ace website – we might have a few to give away in a competition too.